Discussion in 'GMC Jam' started by Alice, Jan 13, 2017. I believe the best way is to remove the voting format of the jam and replacing it so that people will only rank the first 5 most personal favourite, without taking in consideration any criteria. Other evaluations would be optional and not necesarily. As for the points for voters, i think thats a good idea but I guess we shouldnt pressure ourselves taking that into a higher priority when we having other more important matters to take care of. Figured I'd join the discussion since I usually put a fair bit of effort into playing people's games, so here goes! For me, one of the most important aspects of the jams is getting feedback on my games. I put a lot of time into them and want to know if people actually like it. I also believe that most people feel this way and so I want to return the favor, basically scratch one another's back. I think it's fair that if you want feedback, you should give feedback too. It's a two-way thing. With that said, I understand that this is not always feasible. Heck, I'm insanely busy right now with all the work I have to catch up on that I omitted in order to participate in the first place so I'm likely not gonna get more than a few reviews done before the deadline (though I will play them all at some point). It's a shame, but that's just how it is sometimes. We'll just have to accept that. Competition is fun. It's nice to see how you compare to others and it's rewarding to see your work to improve yourself reflect on the rankings. What's important to remember here is that it's a community event and should be taken as such. I don't think forcing people to think a certain way is the way to go here. People have always come up with their own ranking systems, some base their votes on how much they liked the games, some rate the concept more than the product and others play each game for a minute and base their votes on that alone. That's all fine. I do agree that there should be some incentive for voting as not voting would give an advantage (didn't it use to be that you wouldn't rank if you didn't vote for at least top three?). How about giving all other entries a shared first place rank if you don't vote? or perhaps it already works that way? Then again, some people choose not to vote because they haven't had time to play all games, which I think is a fair argument, so wouldn't recommend any larger penalties. - It's all for fun so don't take it too serious. - Be proud of your reviews! Not all people can take the time or have the skills to write good reviews, but it feels so great reading one. The fact that we have both a best reviewer award and mini-awards for good reviewers shows how important you are. Lemth and Siolfor the Jackal like this. Hmmmm, the system will stay as it is for this Jam, of course (kinda late to change things now), but with 3 Jams done with the more or less consistent format, I suppose it might be the time to make a big suggestions topic, where the format for the next Jam would be discussed (after the results for this Jam would be announced, that is). At the same time, while I generally encourage people giving feedback and such and would like for as many games as possible to include it, I'm also aware not everyone has time or motivation to fully engage, and some feedback is better than none. If someone has a good idea how to encourage broad voting and reviewing, I'm intrested. TheMatrixHasMe, dadio and Lemth like this. 1. Nobody liked the theme due to the consistence (or ideas) were far too difficult to their level. 2. Global Gaming Jam got the rest tired for jamming. Tjen again, previous gmc jam we had a low amount as well. I guess we need to come up with something new to motivate members and rebuild hype. I would defonitely want to see a suggestion topic after the jam ends. TheMatrixHasMe and Lemth like this. Obviously I can't speak for anyone but myself, but I was very close to not participating this time just because I couldn't think of a good idea based on the theme that might not already be done to death. To my surprise there were still some pretty interesting ideas but I still feel like the theme may have been too specific this time. The review thing kind of bugs me, I feel like The M said it best. Even though it may not look like it, but I put a lot of time into my entry and it can be a little heartbreaking when you see someone ignore it or leave unconstructive comments for the review. I try my best to give all the games a chance, I'm just as busy as the rest of you but I make time because I care. TheMatrixHasMe, Lemth and The M like this. This was only my second time competing in the Gmc jam, But it almost certainly is my last. Reason being is that I work on something for a full weekend, and then I only get a few numbers thrown at me that are below joke games and some random thoughts of a few people that played my game. Yet nothing constructive. Nothing for me to improve, nor no conformation of anyone even remote enjoying anything that I produced. Both things are something I don't really feel like I got in return. The video reviews where the only one really showing me how someone played my game and what I could learn from it. Besides this I don't feel connected to this community enough. It feels like people that are known get better reviews even if it's just a joke with no content comparable to other games. Now also hearing that just for points it would be better to not review? Feels like a waste of time to go through 30+ games and review each to only get a mere 3 'reviews' that only comment on a single aspect of the voting criteria. Tldr : this jam as is feel like a lot of work including the reviews for a newcomer like me and gives close to nothing in return; I didn't improve as a gamedev for submitting/participating. Just creating the game and showing it to a single friend for feedback yields a more fun and better learning experience for me. TheMatrixHasMe, Nallebeorn and dadio like this. It's a pity to see the low entrant count this time, but I doubt it can be pinned on one particular thing. Likely a combination of factors. So if there was any suggestion about bringing old folks back, that would be cool. 1. Theme was interesting but perhaps more restrictive/difficult to deal with than expected. 2. Prize Pool was the weakest it's been for a long time. 3. There are more & more game jams happening more often. I suspect some people are being drawn away by those (or burnt out from jams in general). 4. The lack of "Hype". I really didn't get the same sense of anticipation/build up this time. Another thing I wonder about is the 3 Theme voting - is it better than we had it before? I'm not sure. Other than that, I'd like to apologise for yet another joke game. Sadly, I just don't have enough free time for anything else these days, but if people feel like those kind of things drag the Jam down for whatever reason, then I won't make any more. Also, highly unlikely that I'll have time to play/review/vote *again* this time - so apologies for that also! I'll try my damnest to clear up some real free time next time round - at least to properly review all the games, as feedback/community interaction is what these jams are all about. I just wanted to say THANKS for all the reviews for Time Tank. As you might have guessed, if you played it, it wasn't completely finished. There was quite a bit we had planned that didn't get into the game. There was also quite a bit that was rushed in just so we could have something at least playable. It's kind of disheartening to see such poor reviews of the game, but understandable because of how it ended up. We're still working on it, trying to get it to a better place. I'll post it up in the 'WIP' or 'Made By' forums when we get it to a nicer, more balanced state. Perhaps we need some general guidelines/tips and good practices on how to write good reviews. I imagine you as a reviewer could learn things about game design from analyzing the games, but that takes some know-how about what you should look for and how you should look. This is something I know I don't do well enough in my reviews (I've actually been playing a few games now, might actually make it through them in time after all) and it's tricky when you just want to rush through all the games. Base upon Lemth's post and Siolfor's post, i actually believe the best way to improving the voting phase is to remove the entire voting format and have everyone just pick their top 5 most favourite entry and nothing more. The host will take care of the evaluation format and use our votes as extra points for the entries. That way, we do less work for voting and have no problems at all. Anyway, we should wait till this jam ends and have a suggestion thread up for more discussion on this. Yeah, I like the idea of restricting the rankings to a certain number. 3 or 5 or 10 sound good. Tho those top 3 at least still need constructive reviews... (reviews are more important really than votes)... and "top x only" doesn't change the fundamental problem of having the time to play through all the games in the first place. It's tricky to know what's best. 1. Choosing one out of three themes is bad. It's not a good start to a weekend of programming getting the one theme you didn't want. The winner should pick a theme which the forum staff accepts and then the competition should begin. The theme will be a surprize for everyone and the theme reveal will go back to actually being exciting, which might bring up the hype which as Dadio said has been low. 2. The jams are too often. I feel like I just spent a weekend with the previous jam. Fewer jams a year will, hopefully, allow for bigger prize pools, more hype and more participants. The first jam on these forums pulled a massive amount of people, probably a lot due to it being quite some time since the last one. Maybe 2 a year? This requires the forum staff to every now and then post updates and countdowns towards the next jam. 3. Joke games don't contribute. If you're new to or bad at making games that's super fine, but don't entry a 15-lines-of-code-game just for the lols no matter if you're a forum veteran or newcomer. That will lower the average quality of the jam, reduce the hype for the next one and have a lot of reviewers writing and wasting time on tips that the dev doesn't even care about. It just creates a big circle jerk. A perfect jam is impossible, though it's important that we change things up to keep it fresh. Personally I don't back this decision. I find the Jam to be the time I get involved the most with the community and GameMaker, and I am super excited each time one gets near. However, sometime life happens and people can't participate. Now, with 4 a year it is already bad that you might be forced not to participate and wait another 3 months (and pray) until you can participate in another. By lowering that to twice a year, people would get really devastated that they couldn't participate and had to wait another 6 months for the next one. I know personally not being able to participate in a Jam and having to wait another 6 months would be a complete motivation killer. dadio and HayManMarc like this. I don't know about others, but I particularly don't like the 3 theme voting. Part of any jam to me is the theme reveal and surprise, whereas now you have basically one whole day to think about ideas based on all three themes. Takes away the suspense/hype for me and effectively extends the jam time (it works for LD in my case, because it's a 10 theme vote and I wouldn't think about all of them since that would be overwhelming). Didn't notice the prize pool. I'll add in some stuff there. I think one of the reasons is more game jams and particularly for this one, the Global Game Jam which was one week ago. Usually the January jams have been on the same weekend as the GGJ for the past few years if I remember correctly, so perhaps (and this might just be me), people had to decide between this and GGJ, or do both at the same time. Whereas this year, people who're into jamming were probably already burnt out from GGJ. I know I was (and I have another jam this weekend too). I wasn't really planning on joining the GMCJam (or was even aware) either until like Friday when my artist friend was like "hey we haven't jammed in a while let's do this". On an unrelated note, I should finish my reviews by this week and put them up all at once. rui.rosario and dadio like this. you play all the games to rank only 5 ? or you choose 5 random games that you rank ? I think that might be why Dadio says it wont help solve the time problem on classifying entries. My opinion, Suppose to be better for us to play all entries. I (almost) always play all the games... then do my final ranking/top 3 whatever. I feel like only playing a handful of random games & voting based on that just skews the votes crazily. if people value constructive feedback over votes/positions, then random 5 games only could work for those who haven't got much free time. I think last Jam was one of those rare occasions where I tried playing a handful of games & voted based on just those, but I felt guilty about that (for all those games I didn't play/vote/push higher). I won't be doing that again. I think if there was some way to draw attention to when the Jam was coming up/starting (visibilty wise) on these forums, that might bump the numbers up. Too many times I see people posting that they didn't know it was on & they missed it. If there could be a massive neon flashing tiltled post about it when it starts, that would be great lol. Reading all these opinions have given FredFredrickson and I a lot of insight for the next jam. We're going to be using this knowledge in both the game creation and the voting process, no matter how that changes in the next jam. An email sent to every member of the forum who doesn't opt-out would be perfect. I'd love that. I'm sure that there are people on the forums who don't have a clue that there even is a jam. That would be called spamming... although gamejolt tends to do that also and it pretty much works fine. Still, it wont help much on bringing back the old time participants. ~4 emails a year to people who are using the service you provide is not spamming. I think a friendly reminder a week or two before the jam could help people plan their schedule and definitely bring back some oldtimers. You mean a banner on the main page of the site, underneath the name? Sounds good but i dont think the admins would want to put up the task to update their website display unless if they want to. Also @ghandpivot, thats not gonna help bring the oldtimers that easily because those oldtimers stop jamming for a reason. Just because they see a simple announcement will not change their mind that easily. You need to find out the core-reason why they left and change that around. Then perhaps announcing it would take effective change on participation or anticipation. I don't know if I count as an old timer with my 9 years on yoyo, but the times I skip jams are due to getting to know about them too late, not having time to clear out an entire weekend as that is quite the devotion. It will feel a lot more worth jamming if you don't have to cancel other plans to do it. A reminder, maybe highlight old winners and have a flashy banner on the site, would go a long way in getting people interested. As of now the jams are quite anonymous. A post goes up a while before the jam starts in a subfolder on the forums that you wont find unless you're already a frequent jammer. I might have gotten the wrong idea here, but I thought these jams were the biggest, if not only, event hosted by the gmc. Surely we could dedicate more of the site to it? I understand that this probably takes a few unpaid man-hours to do, but in a community of programmers it shouldn't be too hard to find someone who'd love to do it. Actually you are half wrong. Dont you realize that your explaination is coming from YOUR experience only. Everyone else might not catch the memo perhaps but i believe that is not the main reason why. Ive been posting about the jam to several people several days before the jam even began and i even left few memos on my statusboard too. Of most of the responses I received from others, they mentioned they wont be able to participate this month. Some of them mentioned that they have important things to do or attend. Some others mentioned to me that they are not hype for it at all. Of not being notified about the jam at all seems to be something to fix too but its not the main reason why we are not receiving lot of participants at all. Believe, Ive been observing and more active lurking on the Jam. I'll be honest, when I put three days of non stop work into my first Jam gaming, working through a migraine, it doesn't exactly warm my heart to get reviews like this from @Aviox. Alright! I have uploaded (at least) 5 reviews, including a playthrough video of those 5 entries. You can find it in my voting post! Check it out! PS: My reviews are harsh as usual. Its to push developers to understand their flaws to then take that into an account and improve it for the next time. Nallebeorn and TheMatrixHasMe like this. Oh don't get me wrong, I know the game play is boring. I didn't have any time to really work on it as I ran out of time. And yes you're right, I took the story approach but didn't even get to flesh that out as I had intended. This Jam is a good exercise in time management and managing expectations. I just wasn't particularly fond of Aviox's approach to throwing me under the bus so tactlessly. I took nothing away from his boring/10 comment but an insult. I do plan on taking what I've learned from this Jam and applying it to my future Jams so I don't bore you all so much I think my biggest flaw this Jam was placing too much importance on story (you guys are gamers) and too much emphasis on theme (I really thought the 12:01 story was perfect for the time loop theme and that it would be an original idea no one else was going to do). In future Jams my focus will begin and end with the game play. You guys don't want to be bored! Perhaps next time I will be standing like Maximus in Gladiator "Are you not entertained?!" Oh and @Misu I saw your review and wasn't offended because you had things to say and were offering constructive criticism/being fair. It doesn't come across the same way at all because the content changes the context. Yeah, sadly I can't even boot :/ All I get is a (very glitched) bluescreen. AFAIK I don't have any integrated graphics at all. @TheMatrixHasMe, thank you for calling me out. You're right, my review was crap. I've taken the time to write you a more thoughtful review in my post, if you're interested in reading it. For anyone else that sees this, I'm going to try to go back through my comments and write reviews that are more helpful and thoughtful before the voting period is over. I'm sorry and apologize for any uncalled-for offensive comment's I've made. Nallebeorn and Siolfor the Jackal like this. My votes and reviews are UP! I think I might have extended my reviews for the last few games I had left to play. Hopefully you can gain something from them. Just uploaded second video with reviews up. Right now I am trying to upload the third one. Lets hope it finishes on time. Tomorrow I might upload 2 more. Unfortunately, im not gonna be able to upload any video reviews. I lack of real internet connection for uploading them and recently ive been dragged away from the computer frequently by my family. Today was my chance of uploading another video but my parents called, forcing me to cancel everything. With the little amount of days left. Its gonna be impossible for me to upload any video. Im gonna have to post only written reviews instead. I still have time to post that within these days of range. I completely failed to accomplish my task because of what I am facing with in my family. This also leads the fact that I might have to stop participating in jams because of this. I usually had free time in my life but ever since my brothers moved out, i became the main target for requests and tasks in the house. Until i have the opportunity of moving out as well, i wont be joining anymore jams. Sorry. Tomorrow i will try to play the rest of the games to publish my written reviews instead. Finished playing all the games. Votes are coming soon. Nice to see someone who didn't participate play the games anyways. Audio: Good music. No sound effects. The game has 4 background musics and 20 sound effects, everything from jumping, dashing, landing in water, swimming, cutting ropes to hitting balls. I guess the music was too loud though, I did notice how there were many more sound effects when the music faded out and in again between loops. Posted my rankings/"reviews". Did not have much time to comment in detail because of lack of time, but if anyone wants, they could PM me for a detailed one. Will try to write some more in the weekend if I get time. Let me know if you'd like additional thoughts or details on your entry. Another thing I don’t like about this entry was the lack of theme usage. What? You saying there is a theme?... Noooo, because going back through time is one thing but creating a time loop is another and this game did not emphasize time loop at all. Perhaps there was an ending story after passing all stages that would clarify more on behalf of time loop concept but then that would still be considered a lack of emphasis on the theme. I feel like in that case, time loop was only emphasized at the end and not during (full out) the game. Which is why I considered lack of usage. It is still used but could have been used more into depth. Also the beginning story didn't explain much of the information so I was expecting to see that concept used within game play but I don't know, it does not seem like much and does not fit in my book. But I really love the game. It was really fun and the in-game music was my favourite as well. Got really pumped by it with each level I enter. Either way, you got a good score. Wish you luck on this entry. It may be too late to say this, but for all the people confused; at the start of the game, you have to head right and go off the screen. You'll find a tower that you have to climb. The game starts there. Just submitted my rankings/reviews and had a quick look through everyone elses. When I was making the 'work' section of my jam game, I thought to myself "No one is going to keep clicking far beyond the submit point, so I should waste any time limiting it". Well, you all surprised me there XD. Well, that's about the last day of voting. The topic itself will be probably closed around the next morning, rather than specifically on midnight UTC, but please do submit your votes within the next few hours. Tomorrow, probably around afternoon, I'll post the Jam results. When I was making the 'work' section of my jam game, I thought to myself "No one is going to keep clicking far beyond the submit point, so I should waste any time limiting it". Well, you all surprised me there XD. FunkyB and dadio like this. I finally finished all reviews for all entrants and ranked every single game! You can check it out on my voting post now! Unfortunately this has become on of the most terrible experiences in a Jam. I was mildly interrupted by my parents throughout the entire Jam event, including the voting phase. Not to mention I lost internet connection at home and could not fulfill the video recordings because of that. I manage to do at least what is more important and necessary. I have to apologize that this Jam did not do my best but I tried hard to do so. Now apparently, this problem I have with my parents will persist through out the entire year since my brothers no longer live with us to attend their needs (which causes me to become the main target of necessity in the house). Therefore, I have decided to stop participating in jams until I could finally move out from this house and have the appropiate privacy I need for jamming and hyping. I wish you all good luck in this jam and for all other jams that will come. That uhhh... seems a bit extreme, why don't you just talk with your parents? Special mention goes to @Misu for giving elaborate feedback on all games. Detective Pixel, FunkyB, Diptoman and 7 others like this. 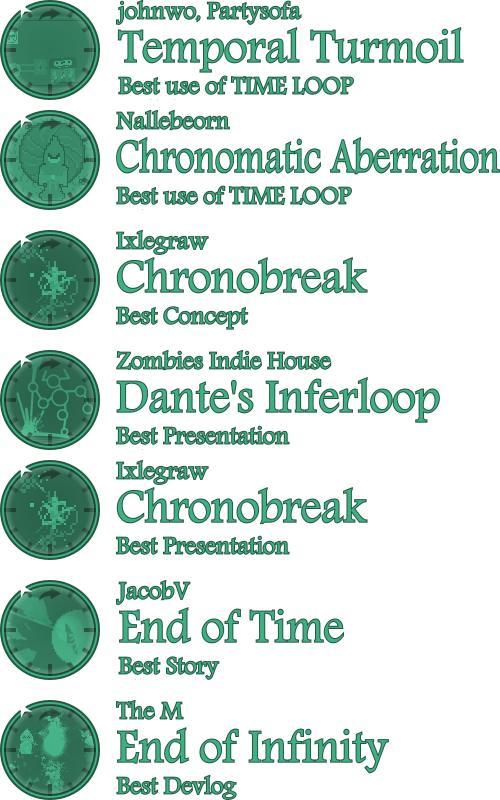 @Ixlegraw Congratulations on all the awards! I was rooting for Chronobreak and anxiously reading all the reviews for it as though it were my own game! Well deserved.